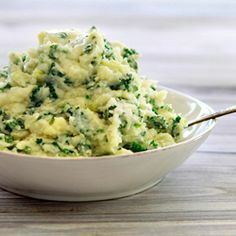 A great way to add greens to your family supper - for more vitamins and minerals replace white potatoes with sweet potatoes. 1) Boil potatoes until fork-tender, approx 30 minutes. 2) Drain water for mashing, reserving one cup of the cooking water. 3) Add the reserved cooking water and mash by hand or with a hand mixer. 4) Add 2 tablespoons of nondairy butter and salt to taste. 5) While potatoes are cooking pull kale leaves from the ribs and tear into small pieces. 6) Heat oil in a saute pan and add onions. Cook over low-medium heat until golden brown for approx ten minutes. 7) Add the kale and garlic and saute for eight minutes longer until the kale is tender and chewy. 8) Add vinegar and stir, combining all the ingredients - season as desired with salt and pepper and remove from heat. 9) Bring the nondairy milk to boil and stir into the mashed potatoes.